Safety is paramount to success at Adolfson & Peterson Construction (AP). In early July, AP achieved 700 days with no lost time injuries on the University of Minnesota’s Combined Heat and Power Plant (CHPP) renovation project. AP Regional Safety Director, Bob Williams, congratulating and thanking the 200+ currently working on the project. This is a unique, intricate project – reaching 700 days with no lost time accidents is a significant accomplishment, something everyone involved should be proud of achieving,” AP Regional Safety Director, Bob Williams, reflected. Safety is paramount to success at Adolfson & Peterson Construction (AP). In early July, AP achieved 700 days with no lost time injuries on the University of Minnesota’s Combined Heat and Power Plant (CHPP) renovation project. 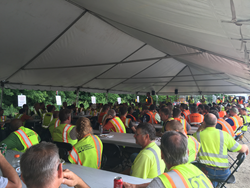 To celebrate this remarkable milestone, AP hosted a hand-carved prime rib safety lunch at the jobsite to recognize and thank the 200+ men and women, numerous subcontractors and University personnel, who have diligently worked on this complex project. AP, recognized by OSHA as one of the safest companies in the construction industry, is committed to an Incident and Injury Free (IIF) safety culture. IIF is a culture of personal leadership where individual and collective responsibility creates an environment where incidents and injuries are unacceptable. AP’s commitment to safety is reflected by achieving this remarkable milestone. “This is a unique, intricate project – reaching 700 days with no lost time accidents is a significant accomplishment, something everyone involved should be proud of achieving,” AP Regional Safety Director, Bob Williams, reflected. Due to both the growth of new University buildings requiring steam service and aging boiler equipment on the Minneapolis campus, the University was at risk for a shortage in firm boiler capacity, provoking construction to begin in August 2014. Through a complicated two-stage configuration, AP has successfully installed new combined heat and power equipment in the existing Old Main Utility Building. Construction is anticipated to be complete by the end of 2016. Adolfson & Peterson Construction is a U.S.-based, privately held firm that is consistently ranked among the top 50 construction managers and general contractors in the nation. Founded in 1946, the company has built longstanding commitments to the regions in which it operates and is known nationally for its innovative and collaborative approaches within the building industry. Adolfson & Peterson Construction serves the education, multifamily, healthcare, commercial, municipal and senior living market segments from its offices in Charlotte, Dallas, Denver, Minneapolis, Phoenix, and Tacoma. For more information, visit http://www.a-p.com and follow us on Facebook, LinkedIn and Twitter.